Water Business Kit Kenya: A guide to starting your own water treatment and vending business, 2012. International Finance Corporation. 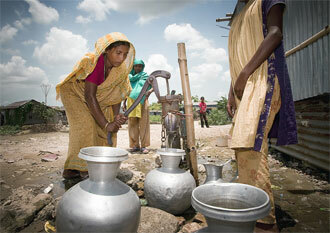 This Water Business Kit is published jointly by IFC and Aquaya. It is intended to provide small and medium enterprises and entrepreneurs with a step-by-step guide to developing a water treatment and vending business in Kenya. Such businesses have been observed to serve customers in many parts of the world with high-quality, treated drinking water. These businesses represent the efforts of independent, local entrepreneurs to meet consumer demand for treated drinking water. Although the kit is based on research and information collected for Kenya, the guidance may be relevant to businesses in other countries. The Water Business Kit is the result of 18 months of business research in Kenya, which included support for the establishment of six demonstration water treatment and vending businesses. The kit answers they key question: ‘Why should you open your own water treatment and vending business?’ and goes on to provide a practical ‘How To’ guide for entrepreneurs. Truely this new achievements are going to safe alot on family income in as much that is spent on medical bills as a result of waterborne deseses will be cutdown. I would like more information on how i can get into starting my own water treatment and vendor services. I have had an idea to do bottled water but was still struggling with information untill i came across your article. Kindly let me know if you can guide in this process.